quite a stir. Today, a little over 2 years since the first machines went on the market, and with 100 machines sold, we asked Rocco Martoccia, the Product Manager who introduced us to the MultiSwiss 6×14 at the launch, for his thoughts on the product’s success. “There have been some dissenting voices concerning our validation procedure, which has been seen as too careful, and which has “slowed down” the market launch of the MultiSwiss. Because we have developed radically new solutions such as the barrel without Hirth gearing and the hydrostatic bearings, we wanted to be certain that the machine was impeccable,” explains Mr. Martoccia. And the statistics bear this out : there were no major issues when the MultiSwiss went on the market. 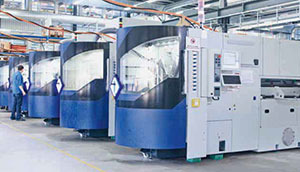 The Product Manager adds : “Having sold 100 machines, we are very pleased to note that our customers appreciate the great reliability and efficiency of the MultiSwiss, and that there have been no issues with the product.” Speaking of efficiency, Mr. Martoccia also tells us about a customer who achieved an availability rate of over 90 %. One of the strong points cited by users is the increased service life of the tools compared to other machines. In some cases they only require changing once a month (we’ll cover this point in more detail later in an interview with the customer). “The machine has found its place in the market – our customers keep on buying them,” reveals Mr. Martoccia. Asked about the typical MultiSwiss user, the manager is surprised to note that almost 25 % of customers were not from the multi-spindle sector, but rather worked on single-spindle sliding headstock turning machines. Could the fact that the MultiSwiss is a six-spindle sliding headstock machine explain this popularity ? “It’s a new phenomenon for us, and we’re proud to be able to say that the launch of the MultiSwiss has changed the competitive landscape. The machine’s capacity and price mean we can propose it as a direct competitor to cam-type multi-spindle machines and/or single-spindle turning machines,” adds the Product Manager. Whether specialists in multi-spindle or single-spindle machines, all the users cited the extremely simple programming (with the TB-Deco and an integrated industrial PC) and operation. The wide frontal access is very popular, as is the tool efficiency, which is between 20 and 300 % higher than that achieved using traditional production methods. Mr. Martoccia explains the two main reasons behind this : “The machine and tool holders are very rigid, but what really makes the difference is the increased damping offered by the hydrostatics and the shorter bar length, which minimises vibrations.” (we’ll discuss this further later on). The modern design and user-friendly operation of the MultiSwiss also make it easier for companies using it to find qualified staff willing to devote themselves to multi-spindle machining. “The machine is as simple as six 2-axis turning machines, and programming is 90 % standard ISO code with macros and help functions. The vast majority of our customers that use this machine are fully committed to the integrated PC and the TB-Deco tool, which makes life much easier,” explains the product manager. Remote maintenance also keeps intervention and servicing costs down, thanks to improved diagnostics and more targeted operations. What about 1.5 metre bars ? Since the market launch, certain customers have questioned the replacement of three-metre bars with 1.5 metre bars. Mr. Martoccia explains : “We decided to work with shorter bars to improve space, precision and handling conditions”. The feedback from users has justified our decision. 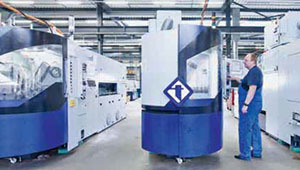 And although the length cutting operation involves an additional cost, this is compensated by a reduction in material loss, in particular thanks to a significantly reduced drop length (5 times less than that on single-spindle turning machines and 3 times less than that on other multi-spindle machines). The increased feed precision compared to other multi-spindle machines, which feed to a bar stop, also reduces facing material loss. On short workpieces, this can mean a gain of 25 %.” The lack of a precedent meant that the initial decision to use 1.5 m bars was highly ambitious. Certain suppliers now offer 1.5 metre bars as standard in their range (notably Ugine in stainless steel). This results in greatly simplified handling. Supplied as standard with Tornos tool holders, the MultiSwiss machine can also be fitted with new quick-change GWS tool holders from specialists Göltenbodt. Mr. Martoccia explains : “We started again from scratch and consulted several tool system manufacturers, before deciding to work closely with Göltenbodt.” The result : A quick-change tool holder system which is complementary and interchangeable with standard Tornos tool holders. Combinations are also possible, and the less expensive Tornos solution can be chosen for positions that do not require frequent tool changes, for example. During the IMTS show, an American customer, who had come from Chicago to buy a new singlespindle turning machine to add to his existing inventory (numerically controlled single-spindle turning machines and outdated cam-type multi-spindle machines), discovered the MultiSwiss. This innovative and very competitively-priced Swiss-made turning machine suddenly turned his dream of purchasing a modern multi-spindle machine into a reality! Mr. Martoccia concludes : “The customer has been working with the machine for a few months and is already planning to buy another of the same type. It has really opened up new markets for him.” The MultiSwiss represents a new gateway to the highly productive world of multi-spindle machining. What if it were to become your first multi-spindle machine ?